Are you concerned about the toxicity of Acrylic paints? You may be concerned about the environment as well as your own health and want a non toxic acrylic paint for artists. You might want to buy paints for your children, have an allergy, or want to use our paints for toys. A number of readers have asked whether our paint is safe for wooden toys as well as for use on children’s furniture. Others have asked about the impact of waste on the environment. No, they are not. 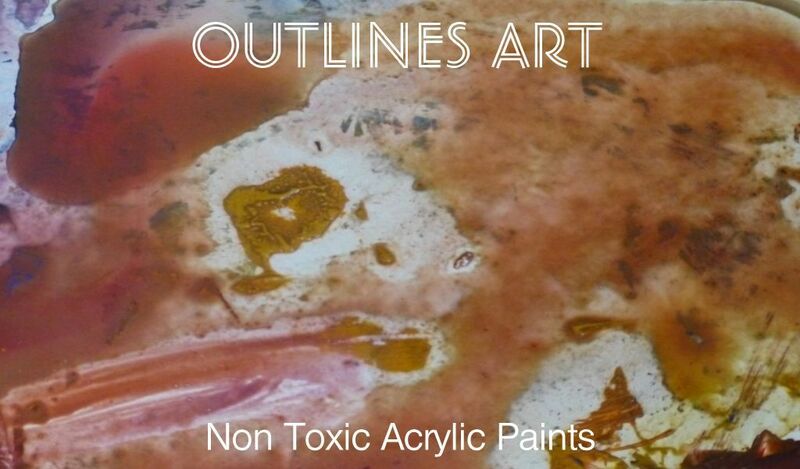 Outlines acrylics are non-toxic. They are allergen and odour-free*. Our paints do not contain any pure pigments that contain toxins, using synthetic colours instead. Some may use a combination of colours to achieve the required hue. *The paint itself is odourless, however the packaging and tubes release a plastic smell on first opening that some might find offensive. The solution is to remove the tubes from the box and allow them to air for a while. Extra-sensitive people might even find the opened tubes have a plastic smell. The symbol ‘CE’ on the packaging refers to the safety standards and tells you that they are non toxic. CE marking is a key indicator of a product’s compliance with EU legislation. Customs require copies of independent laboratory certification of non-hazardous and non-toxicity. To qualify for the certificates products have to comply with those regulations. Outlines Acrylic Paint Sets have been tested and certified non-toxic and non-hazardous to ASTM D-4236 and EN71-3 (CE) standards. The hazard warning is mentioned because small parts, such as closing lids, may present a choking hazard to small children, as well as the possibility that children could ingest it. Kids can be quite capable of eating large amounts of paint if left unattended. When you use them for typical acrylic painting purposes then they won’t be harmful to you. What are typical painting purposes? Applying Paints with a brush (to the canvas, board or other surface). Applying Paints with a pallet knife. Getting paints on your hands accidentally. Applying Paints with your fingers – It’s a good idea to wear protective gloves. If you must paint with your hands it is best to wash them with soap and water at the end of each session – or at intervals if the session is long. The key is to avoid extended time and extensive coverage. The paint may seal your skin and prevent it from absorbing oxygen. Although these paints are not harmful to your skin in small quantities, they are not intended for face or body painting. As well as the above points, they can be difficult to remove without a lot of rubbing when dry. 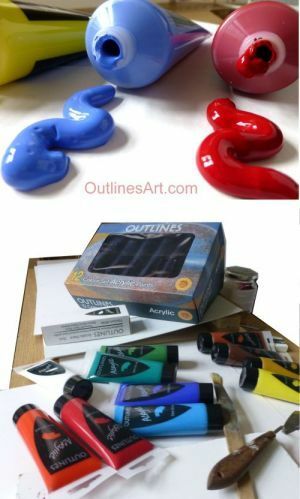 Is Outlines non toxic acrylic paint safe for babies? This paint should only be used by babies and children under three years old (3) under strict supervision at all times. Never leave small children alone with any paints and keep the paints stored out of their reach. What Activities Render Acrylic Paints Harmful? Please bear in mind that most chemicals used in paint are not fully tested for chronic toxicity. Users should avoid ingestion. You really shouldn’t lick your brush either! Please avoid excessive skin contact. Don’t let paint on your skin become caked on – clean up regularly. Avoid inhalation of spraying mists and sanding dusts. Avoid concentrated vapours – Although I have not experienced these, I always suggest making sure your painting space had a good supply of fresh air. This is good for creativity too. These paints are not intended for use with a spraying tool. Spraying puts particles in the air which can be inhaled. If you need to sand your work, use a mask and either do it in the open or use a sanding tool that collects the dust. I do not have medical qualifications so cannot advise about ingredients. Links to more information can be seen on our Product information page, which is also mentioned on our FAQ page. If you have found this article useful, or wish to add any safety tips of your own, please use the comment box below. Concerned about your own health as well as the environment and want a non toxic acrylic paint for artists? Questions about safe use and ingredients answered here. Symbols on packaging what do they mean? What is EN71-3 (CE) ?